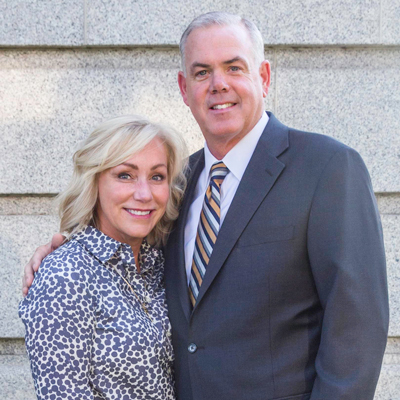 BYU Basketball Coach Dave Rose and his wife, Cheryl, have also been passionately involved in the fight against cancer. Thanks to the research, treatment, and unique care of HCI, Dave overcame insurmountable odds to become one-of-five in a million to survive pancreatic cancer after being diagnosed in 2009. Cheryl has several family members currently battling this deadly disease, and lost one sister, Janet, to breast cancer. She made a pivotal promise to be her voice, and continue the fight in Janet’s name. Dave and Cheryl have been involved in many charitable events in the past, including serving as honorary chairpersons for Children with Cancer Foundation. Cheryl graduated from Dixie State University and went on to become the coordinator for the Dixie State University Alcohol and Drug Prevention Program, which she helped to establish. She was appointed by the Department of Education as the Regional Coordinator for the Network of Colleges and Universities; serving Utah, Arizona and Nevada. Cheryl served for twelve years as the Vice Chairperson of Mac’s Gift, a charitable organization dedicated to providing assistance to children with cancer and their families. She received the Beacon of Hope Award in 2005 for her efforts in this cause. She also served on the Coaches vs Cancer Wives Committee. She currently serves as the Chairperson of the Simmons Center for Cancer Research on the campus of Brigham Young University. Cheryl’s greatest accomplishment and joy is her family. She and Dave are the parents of three children and grand parents of 8. She loves reading, traveling, flowers, shoes and spending time with people she loves. Coach Dave Rose was named the BYU men’s basketball coach in April of 2005. Under his direction, the Cougars have enjoyed the most successful era in the program’s history. Beginning with the 2005-06 season, Rose has led BYU to a 305-111 record, 12-consecutive trips to the postseason (NCAA from 2007 to 2012, 2014 and 2015; NIT in 2006, 2013, 2016 and 2017), 12 straight 20-win seasons, five seasons ranked among the top 25 teams in the country (2007 to 2012) and four regular season conference titles. He is BYU’s all-time leader in winning percentage (.733) and second all-time in wins behind Stan Watts, a member of the Basketball Hall of Fame. Dave and his wife Cheryl have three children and eight grandchildren. Rose served in Manchester, England, from 1977-79 between his two years as a player at Dixie State College. He was inducted into the Dixie State Athletics Hall of Fame on Sept. 14, 2013. A native of Houston, Texas, Rose graduated from the University of Houston where he was a shooting guard and co-captain of the famous Phi Slama Jama team. Rose was honored on April 6, 2008, by the National Association of Basketball Coaches with its Game Pillar Award for Service, one of four Pillar Awards that the Association annually bestows on the most deserving among its membership. Coach Rose has also been heavily involved with Mac’s Gift Children with Cancer Christmas Foundation and currently serves on the National Coaches vs. Cancer Coaches Council.